For the past several weeks, I've had the opportunity to review the HP ElitePad 1000 G2 tablet PC running Windows 8.1. This is HPs 2nd generation ElitePad tablet PC - a very thin, light tablet that incorporates a modular design so that you can expand its capabilities by adding an Expansion Jacket, a Security Jacket, or a Productivity Jacket. You can also get a desktop docking station with multiple expansion ports or a rugged case (which may be very important in the health care setting). At 9.2 mm thin and 1.5 lbs in weight, the ElitePad is one of the lightest and thinnest Windows 8.1 tablet PCs on the market. In 2013, I reviewed the 1st generation HP ElitePad 900 and even compared some of its physical features to an iPad 3. At a glance, the ElitePad might remind someone of an iPad because it has a thin design, curved edges, and the colors are similar. Of course, comparing Windows 8.1 to iOS is like comparing a pickup truck to a bicycle. 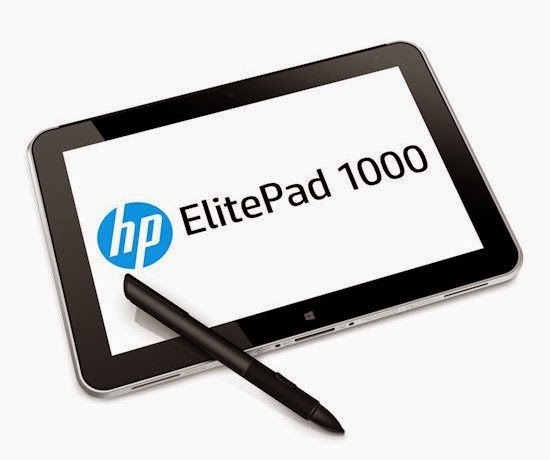 The newer ElitePad 1000 looks almost identical to the older ElitePad 900. The biggest difference in appearance is that HP replaced the physical Windows button on the front with a capacitive button in the newer version. The HP logo on the back is also larger on the newer version. Performs much faster. The 3rd generation Intel Atom processor (Z3795) performs very nicely and still delivers very long battery life. The ElitePad 1000 runs a 64-bit version of Windows 8.1 and also supports enterprise-level encryption and security features (which is critical for enterprise health care users). Uses a newer Atmel digital stylus pen (HP Executive Tablet Pen G2) that writes very nicely. Many physicians and nurses rely on pen-based input and also use their tablets to take notes. Has a higher screen resolution at 1920 x 1200 (compared to 1280 x 800 on the original ElitePad). Overall, the newer ElitePad 1000 is a very nice option for someone who is looking for a modular Windows 8 tablet that is thin, light, and delivers all-day battery life. Those who have used tablets powered by earlier Intel Atom processors (1st or 2nd generation) may have some concerns about performance. The 3rd generation Intel Atom processor is fast, but it's still not as fast as Intel Core i3, i5, or i7 processors. Keep in mind that the ElitePad won't get hot, it doesn't require a fan for cooling, and it will last all day. Surface Pro 3 is faster, but it has shorter real-world battery life compared to the ElitePad. Surface Pro 3 may also run a bit warm/hot when you're holding it in your hand. ElitePad offers multiple docking and expansion sleeve options for greater flexibility as a tablet. Surface Pro 3 has a built-in kickstand to hold the tablet up for viewing and for using on your lap. ElitePad is smaller and lighter by approx 0.25 lbs. Surface Pro 3 has a larger 12" screen vs. the 10.1" screen on the ElitePad. ElitePad offers built-in 4G LTE wireless. Surprisingly, the Surface Pro 3 does not offer built-in 4G. Digitizer pens: Surface Pro 3 uses a N-trig, ElitePad uses Atmel. Both work well. Both require batteries in the pen. Keyboard docking options: Surface Pro 3 clicks on a magnetic keyboard + touchpad while the ElitePad fits into a Productivity Jacket keyboard case. Bottom line: the Surface Pro 3 is being marketed as a "laptop replacement" and the ElitePad is an enterprise tablet that's been optimized for use as a versatile tablet, not as a laptop replacement. Productivity goals: Many enterprise electronic health records (EHRs) still don't run well enough on an iPad to provide adequate functionality and productivity for physicians and nurses who want to get some serious work done while they're mobile. Do you need to use a pen with the tablet? Unlike the iPad, many (but not all) Windows 8 tablets support active digitizer pens. In health care, this is often a critical feature because of the need to jot notes while standing at the bedside, to sign digital forms, or to have greater precision when tapping on the screen. Do you need built-in 4G LTE, or is this simply a "nice" option since you always have access to Wi-Fi? Do you plan to use the device mostly as a laptop or mostly as a tablet? If you plan to hold the tablet in your hand and do work using the touch screen or pen, then size/weight/heat become key considerations. You may also want to get a tablet that fits into a rugged case or uses a hand strap. Overall, the ElitePad 1000 is an excellent Windows 8 enterprise tablet for those looking for a mobile device that is very thin and light. Adding modular expansion sleeves will provide further flexibility and it's nice to have options like a rugged case, 4G LTE, and an active digitizer stylus pen.